Electricity is an essential part of our modern lives. It powers our economy, generating the economic activity that underpins our high living standards. It also allows Canadians to enjoy the comforts of modern life, from warm homes and warm meals to internet access and entertainment. The full enjoyment of these benefits depends on electricity remaining affordable for people across the income spectrum. But affordable electricity appears to be a growing challenge for Ontarians. In fact, electricity prices in Ontario have risen substantially over the last decade, placing a burden on many Ontarian households. Indeed, the province of Ontario has the fastest growing electricity prices in the country and its cities have some of the highest average residential monthly bills in Canada. Electricity prices in Ontario have increased dramatically since 2008 based on a variety of comparative measures. Ontario's electricity prices have risen by 71 percent from 2008 to 2016, far outpacing electricity price growth in other provinces, income, and inflation. During this period, the average growth in electricity prices across Canada was 34 percent. Ontario's electricity price change between 2015 and 2016 alone is also substantial: the province experienced a 15 percent increase in one year. This was two-and-a-half times greater than the national average of 6 percent during the same period. From 2008 to 2015, electricity prices also increased two-and-a-half times faster than household disposable income in Ontario. In particular, the growth in electricity prices was almost four times greater than inflation and over four-and-a-half times the growth of Ontario’s economy (real GDP). The large electricity price increases in Ontario have also translated to significant increases in monthly residential electricity bills. Between 2010 and 2016, monthly electricity bills (including tax) in major Canadian cities increased by an average of $37.68. During the same period, electricity bills in Toronto and Ottawa increased by $77.09 and $66.96, respectively. This means that residents in Toronto experienced electricity price increases of double the national average between 2010 and 2016. In Toronto and Ottawa, the average monthly bills for residential consumers including taxes in 2016 were $201 and $183, respectively. On average in 2016, residents of major Canadian cities paid $141 including taxes for monthly electricity bills. This means that Toronto’s monthly electricity bills (including tax) are $60 more per month ($720 more per year) than the Canadian average. Consumers in Ottawa pay $41 more per month ($492 more per year) on electricity bills than Canadians in other provinces. 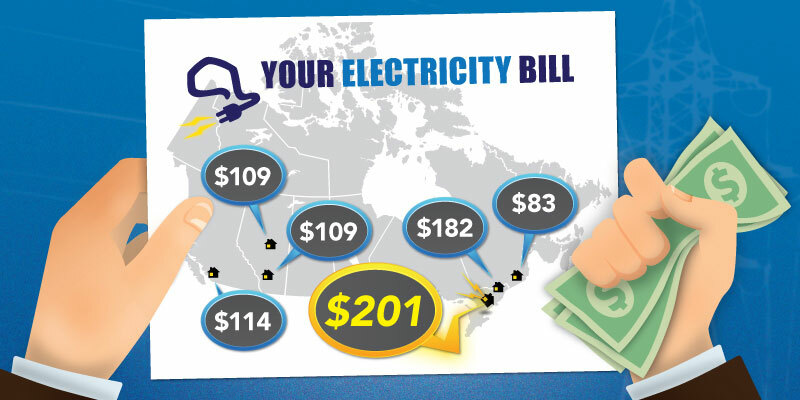 Montreal had the lowest monthly electricity bills for residential consumers at $83. The problem of skyrocketing electricity prices and high bills is a made-in-Ontario problem directly tied to the provincial government's policy choices. Ontario's policies around renewable energy (wind, solar, and biomass) have resulted in large additional costs for consumers. More specifically, Ontario’s high electricity prices can be attributed to poorly structured long term contracts, the phase-out of coal energy, and a growing electricity supply and demand imbalance in the province that is resulting in Ontario exporting electricity at a loss. High electricity prices for Ontarians, particularly when taxation is included, should be of central concern when the government is devising energy policy decisions. Given the critically important role that affordable electricity plays in peoples' standard of living, it is time for the Ontario government to have a hard look at how their policy choices are affecting peoples’ lives. It is also time for the government to begin pursuing meaningful policy reforms aimed at lowering electricity bills for Ontario residents.